Once again, I would like to thank Hershey’s Canada for providing me with their Chipits for today’s post. Please check out my double chocolate cookies for a chance to enter the Hershey’s Chipits giveaway taking place until Monday, December 14th, 2014 at 11:59PM. I have always been fascinated with chocolate and how it works. Like any product, there is always the good and the bad. Good chocolate will yield great results, with a great taste. Cheap chocolate can be finicky as cocoa ratios may be off. Plus, you can notice a difference in taste/texture when it comes to some chocolates. Everyone has their favourites, and I will admit, Hershey’s Chipits are my go-to chocolate chips for any of my cookie baking. Popular here in Canada, you can easily go down the baking aisle and come across half a dozen or more different flavours (ranging from standard chocolate flavours to Reese’s Pieces, Skor, and more!) It is not strange to see a bag in just about everyone’s household. When I was offered to write a recipe for Hershey, I knew I did not want to go the tradition route. Sure, I made my double chocolate cookies to start off my giveaway, but who can resist making delicious cookies when they have 20 bags of Chipits?! I wanted to transform the chocolate chips, and did exactly that with this chocolate ganache glaze. I have worked with ganache before. It is not hard, but there are some precautions one must take. I personally use the method of pouring very hot whipping cream over the chocolate and leaving it untouched for a couple of minutes. This way the chocolate has the opportunity to heat and melt evenly. Stirring too early may lead to uneven heating of the chocolate and a grainy texture may form. Also, do not do what I did. I used milk chocolate, but stirred in the tiniest bit of leftover bittersweet chocolate chips I had lying around. Mixing the two seemed to cause issues with the melting of the chocolate. While the texture was smooth and no way grainy, I did happen upon a lot of air bubbles (probably from me over-mixing trying to combine the two chocolates) and the appearance of solidified chocolate in the glaze (even though there was no grain.) Stick to one chocolate type to ensure a smooth chocolate ganache glaze. Air bubbles can be minimized by using a spatula as opposed to a whisk and stirring just enough to melt the chocolate. I wanted a classic cake look when I showed off this chocolate ganache glaze. The cake is my standard chocolate recipe, and my buttercream is vanilla flavour. I decided to do a two-layer 8-inch cake for my family event so people were not cutting into a towering three-layer 6-inch cake. 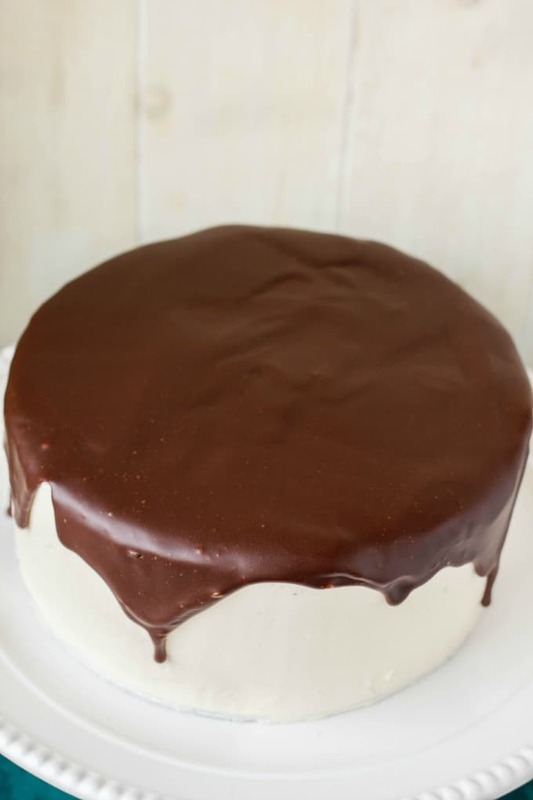 This chocolate ganache glaze recipe made enough to cover the top and sides of my 8-inch cake. If you want to cover your entire cake, I would suggest doubling the recipe. But I wanted to show off the white and brown contrast between the chocolate and the icing. Plus, look at how smooth I got that buttercream!! You can use any chocolate you like here, but be careful with white chocolate. It can be finicky and tends to be over-heated fast. Start with dark chocolate first and make your way to white chocolate. Otherwise, you should have no problems with this recipe! I allowed my ganache to cool until I reached the pouring consistency I was comfortable with. You do not want it too liquidity, or it will pour right off your cake! Pouring this ganache onto a chilled cake will help ensure the chocolate firms up before it reaches the bottom of the cake. In a small saucepan, combine the heavy whipping cream and salt over medium-low heat. Heat until the mixture is very hot, but do not boil. Basically you want a scalding mixture. Stir occasionally so no skin forms on top. While the mixture heats, add the chocolate to a medium-sized mixing bowl. When the whipping cream is hot, pour it carefully over the chocolate chips. DO NOT TOUCH. Allow it to sit for a minute or two and then stir. This will help ensure the chocolate melts evenly and no grain appears. Stir in the corn syrup and vanilla. Allow to cool for about 10 minutes, or until the mixture is thick but still easily poured. 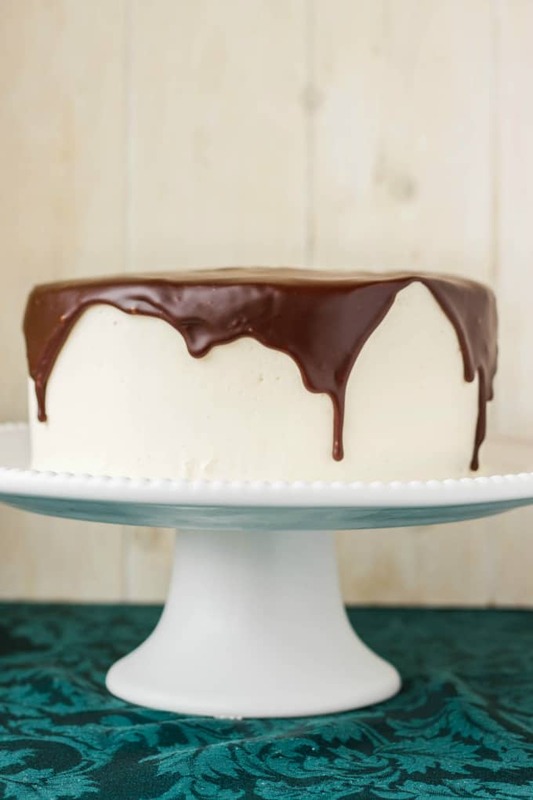 *The secret to coating a cake with chocolate ganache cake to have that cool dripping glaze effect, you want to make sure your cake covered in buttercream is chilled in the fridge. 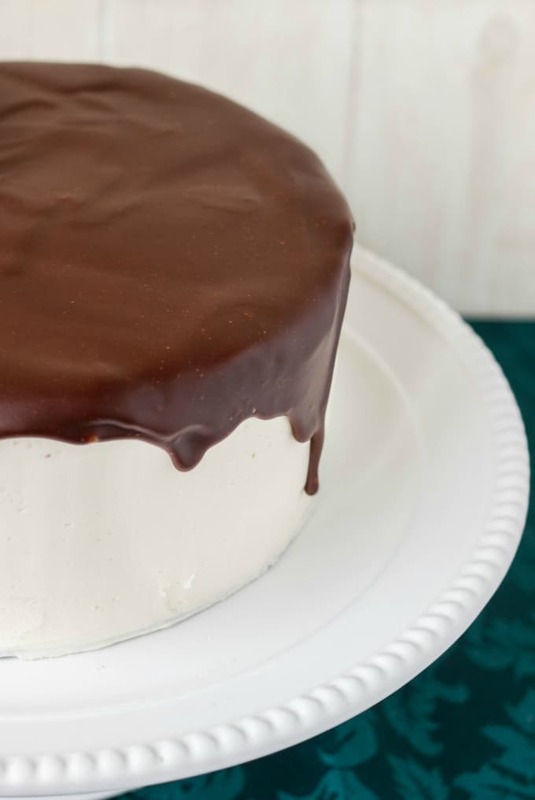 Bring it out and pour the ganache on top, using a spatula to smooth it over the sides. 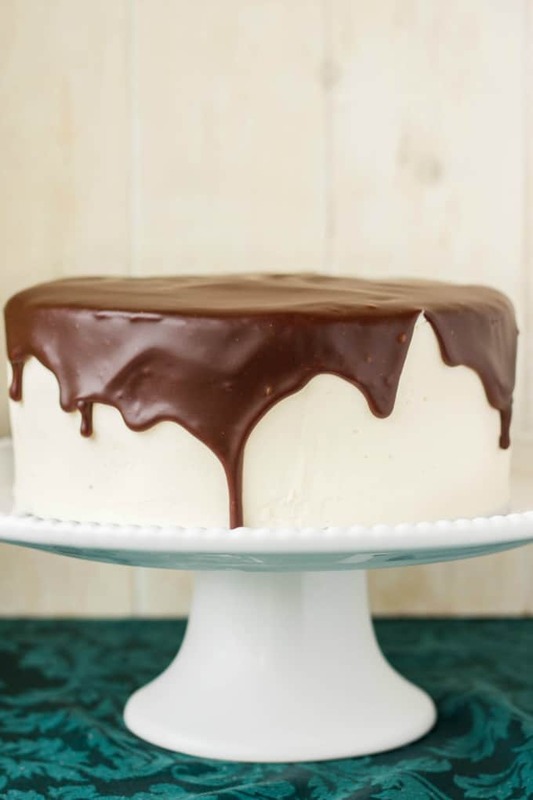 Since the cake is cold, the ganache should start to firm up as it goes over the sides, resulting in thick drip marks that firm up to the surface. Place the cake back into the fridge to finish firming. Sit at room temperature and serve. And just a reminder, please enter the giveaway courtesy of Hershey’s Canada for a chance to win your own package of 20 bags of Chipits! I am an avid baker and I have barely dented my supply! Simple, easy, and delicious! I like how sophisticated the cake looks with minimal effort. I can still see my smoothing flaws on top of the cake, but it is definitely getting better with practice. 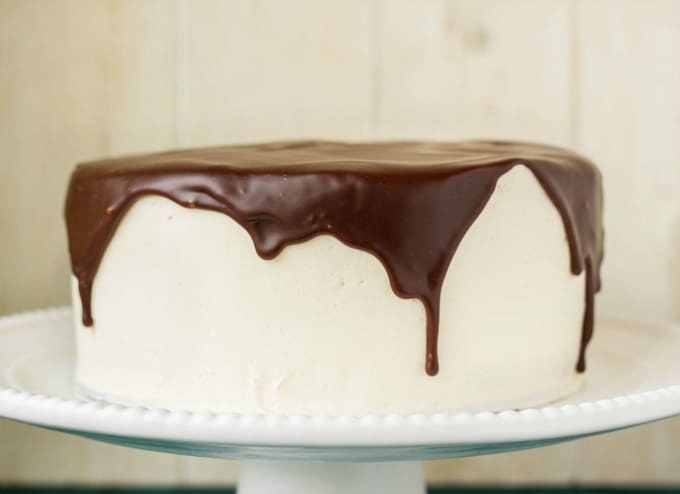 This chocolate ganache glaze will show your imperfections, but that adds character to your cake! This is a sponsored post. I was fortunate enough to receive products from Hershey (all those amazing Chipits!) Though products were received, all opinions are my own and I would not recommend a product that I did not enjoy. This is such a pretty cake. I like it when food is delicious and beautiful. No, no, we can never think like that, or too many cakes would be left untouched! 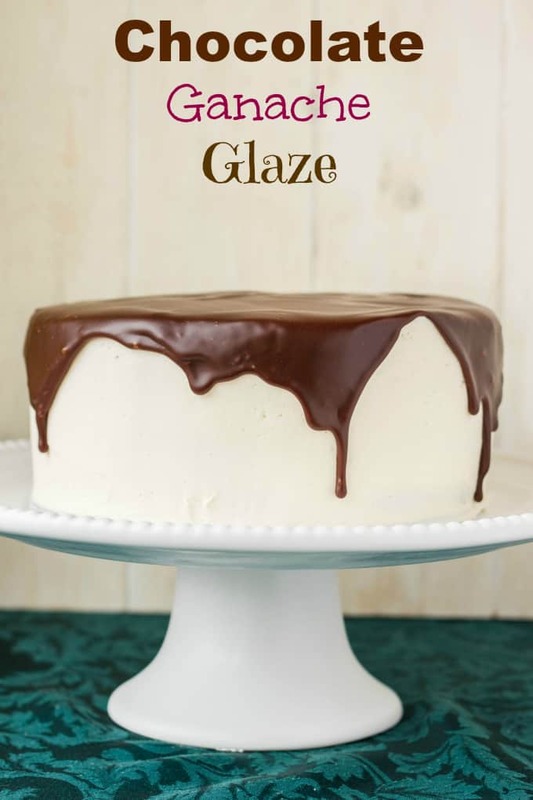 Ooh, goodness, a chocolate ganache glaze would make just about any dessert better! I'll have to check and see if they have a dairy-free dark chocolate version of those chips! I am curious about that as well, Alisa. Good luck on the search! Gorgeous! I love a good ganache! It is such a simple technique and it elevates a dessert incredibly well! Wow…this is just beautiful!!! The ganache looks silky and delicious! Thank you! The corn syrup really helps make it smooth and easier to pour. Very pretty! It's hard to beat a chocolate ganache glaze on a cake. I love how people who are not big chocolate lovers can enjoy this ganache on a simple vanilla cake. Your method works perfectly as well. I think chilling the cake is more for impatient people like myself who cannot wait to pour the chocolate! You can omit the corn syrup altogether. I used it for more of a sheen/pliable liquid, but you don't need it. 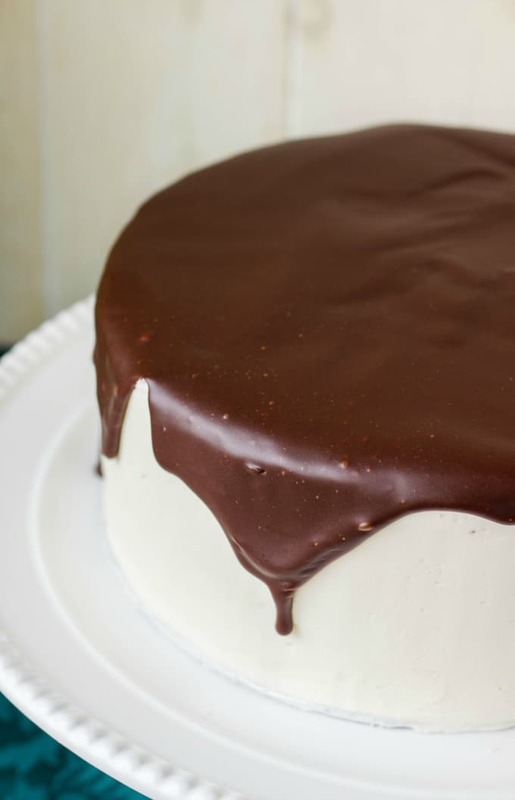 Just wait to the ganache cools a bit so you are not pouring liquid all over your cake!